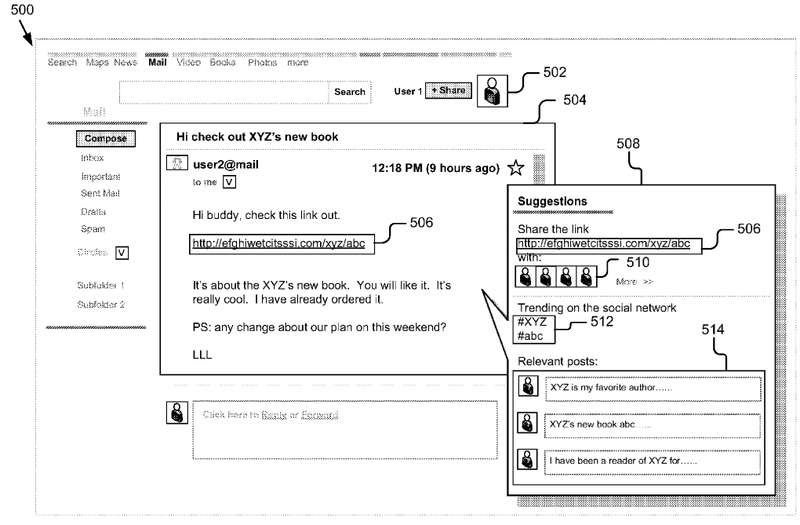 Google was just issued a patent, “Encouraging Conversation in a Social Network,” that claims a system that will assess trends that will help users, companies, and brands tailor their social media posts to drive engagement across social media shares. The proposed system is built on email communication and advances on a similar idea—a link is shared from one user to another. When the link is clicked, Google will utilize a pop-up system that will suggest how to share the link on social media. Essentially, the system recommends social activity data and social conversation to a user and is able to determine knowledge data describing topics related to the message. The patent suggests that Google will be utilizing and analyzing the content within the email to propose different topics that a user might want to post. For example, in the image above, three potential suggestions pointing to their “favorite author,” “new book,” or “I’ve been a reader of…” were generated, which amplifies the conversation beyond the email and into the social media realm. This patent may give Google a strategic edge in the social media marketing game, and perhaps a step towards automating certain roles currently fulfilled by social media marketers.